Electrical Waste Management Ltd was established in 2002 with the advent of the Chlorofluorocarbon regulations and was initially set up specifically to cater for the return of CFC containing equipment being returned through the retail network. The company is now in its eight year of operation and has moved from operating on behalf of the retailer network to operating on behalf of the Government compliance schemes and Business to Business (B2B) operations, for the collection and recycling of all categories of Waste Electrical and Electronic Equipment and scrap metal materials. 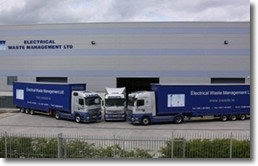 Electrical Waste Management has recently moved to a new facility in order to cater for expanding business. The facility comprises of a 2500M2 facilities complete with offices and yard space of approximately 8000M2 . Electrical Waste Management has certified weighing facilities on site. Other equipment includes mechanical handlers, forklifts, loading shovels and a 400 tonne shear baler for the consolidation of metal waste streams. Currently Electrical Waste Management Ltd has transfrontier documents open for Fridges, chlorofluorocarbons containing equipment, all small domestic appliances and computers as, required under the Transfrontier Shipment regulations. The company is also in the process of making applications for other streams such as batteries and mobile phones. Transfrontier shipment documents are in place for export of hazardous waste streams to state of the art facilities in the UK, Holland, France, and Germany. Greenogue Facility, Rathcoole, County Dublin. Unit 648 Jordanstown Drive, Greenogue Business Park, Rathcoole, County Dublin, Ireland.